Many people want to catch a salmon on their fly rod, but where to start and what to do is another whole drill. 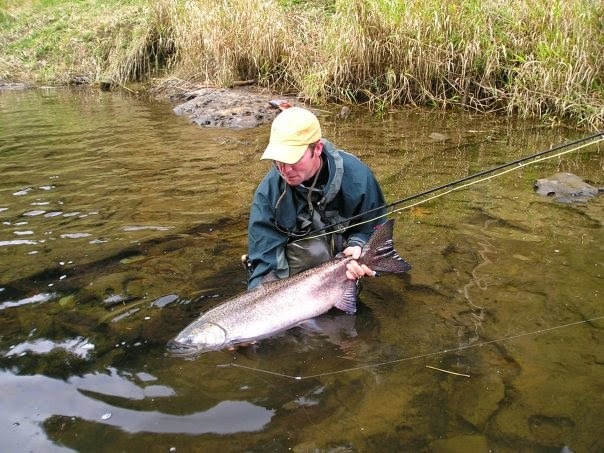 Just getting a 10wt and having some flies that are known to catch salmon is not all it takes to catch these mighty fish. You have to be in the right place at the right time, and the window of opportunity is short and runs out fast. When you time it all together it can be "Fish On" for lots of time during a fishing session. When you are in the wrong place at the wrong time it seems like salmon are something that is mythological to catch on your fly rod. 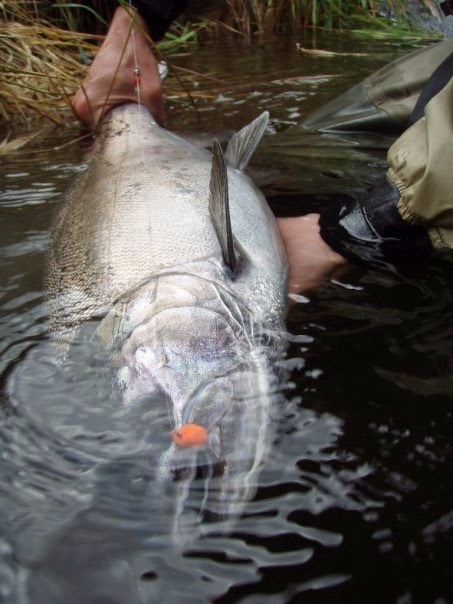 Super chrome bright Chinook like this one will eat flies very willingly, & can be a sturdy battle on a 10wt. You will need different lines for different styles of fishing, and each line fishes a niche of salmon fishing with a fly rod. The next thing to talk about is the fly lines to use, and with what flies to match up for those lines. When you fish an egg pattern, you do not do it on a shooting head or on an Intermediate Striper line. You would need a floating line like a Salmon/Steelhead taper matched with a strike indicator for flies like egg patterns or leeches to be fished on a dead drift presentation. On the other hand if you want to catch those sea lice ridden chrome bright Chinook on a swung/slow stripped Clouser minnow, you better be equipped with sinking shooting tapers (intermediate, Type II, and Type III most of the time) matched with an intermediate sinking running line for the best versatility or a Intermediate Striper line for a better casting option that is popular amongst many salmon fly fishers in Oregon. The same line options would be what you would want if you are going to fish a pool with bright healthy fish rolling in a river several miles up whether you are fishing Orange Comets or pink leeches. A tidewater/lower river pool Chinook salmon setup for Oregon consists of a 10wt Single hand rod paired with a heavy duty large arbor reel lined up with a clear intermediate shooting taper looped onto an intermediate running line. A Clouser Minnow like this one is a great choice for those grabby fish. A switch rod with a floating line is an excellent choice for fishing the freshwater portion of rivers with shelves, bottlenecks, and runs. It is easy to switch back and forth from using poly leaders for swinging spots to a tapered leader, egg pattern or leech, and a strike indicator for dead drift presentations. 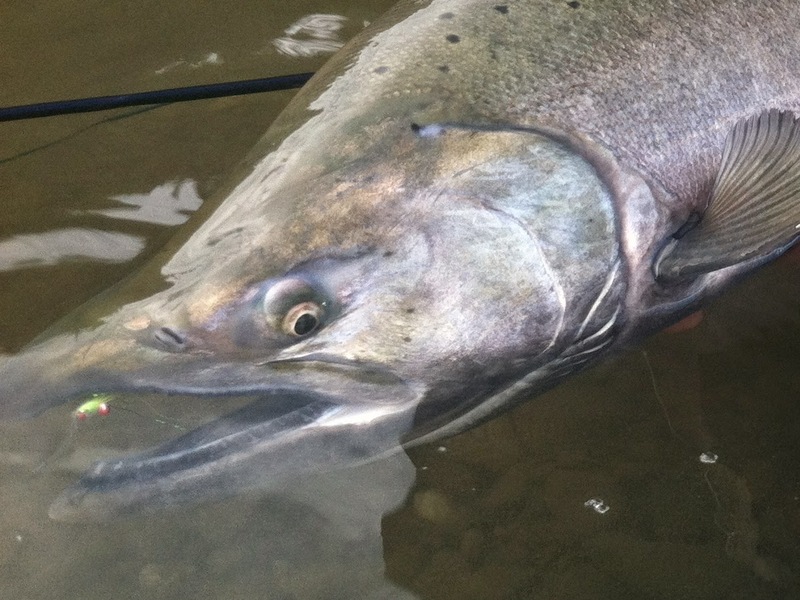 For the salmon fishing spots now, they are for you to find on your own, but words of advice. Salmon fishing is something that is popular, and you will likely have some other people around who know how to catch them. There are secret spots, but they are more likely to be upriver in the freshwater portions of rivers. Those bottleneck in the river spots and shallow shelves are the secrets to be found that can offer solitude and epic salmon fishing on a fly rod. Anything tidal or near the tidal stretches of rivers will not be a secret, and there will likely be anglers around. Where to stand in a spot, and the little secrets of how to get them consistently can still be your secret that you discovered. There are only so many holes on the lower reaches of rivers and tidal areas, and these fine fish attract the people and fishing pressure. If you are out salmon fishing and you don't see fish rolling, or people around you are likely in the wrong area. Not to say that you cannot be at a good salmon fishery with nobody present (I have been at epic places salmon fishing with nobody buy my wife and I around), but chances are if you had an epic day out there, then that you were at the right place at the right time. 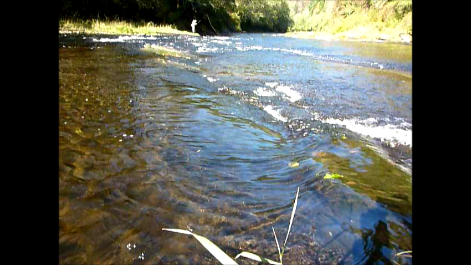 Spots like this can concentrate fish because it bottlenecks the fish, and it is skinny upriver where the fish would have their backs sticking out of the water, and it is very wide and broad downriver exposing the fish and making them vulnerable. Shelves (3-5 inch deep water) across the river make fish passage too shallow, but the little slot on the far bank (which is 4-5 feet deep) is where every fish must swim through on their way upstream. When the average depth of the river can be from inches to a few feet deep; you can assume a pool that is as big as an Olympic swimming pool is going to have lots of fresh salmon in it (especially when it is about 1 mile from the ocean). One final and most important piece of advice I would have for salmon fly fishing in Oregon is that you have to be "the good fishing report" and you cannot wait to "hear the good fishing report". It is typically too late if you wait to hear about the good fishing before you decide to go. You have to speculate when to go, and not go when you were told it was good because it will likely be too late, and you will have missed it. Not much is better than landing a Chinook salmon like this in September through December in Oregon on your fly rod. An excellent fly box representing what an Oregon Chinook Salmon selection for tidal / freshwater lower rivers should look like.